mRNA expression of AB, SO, CD, OC, NA and GP genes in H-GFP and H-5A cell lines assessed by RT-qPCR. Relative expression of MDM2, p21, Survivin, PUMA, BAX and Bcl2 genes in N-3a treated cells compared to controls. 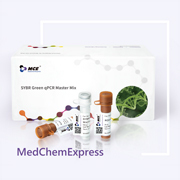 The Super Hot-Start SYBR Green qPCR Master Mix is a ready-to-use qPCR cocktail. 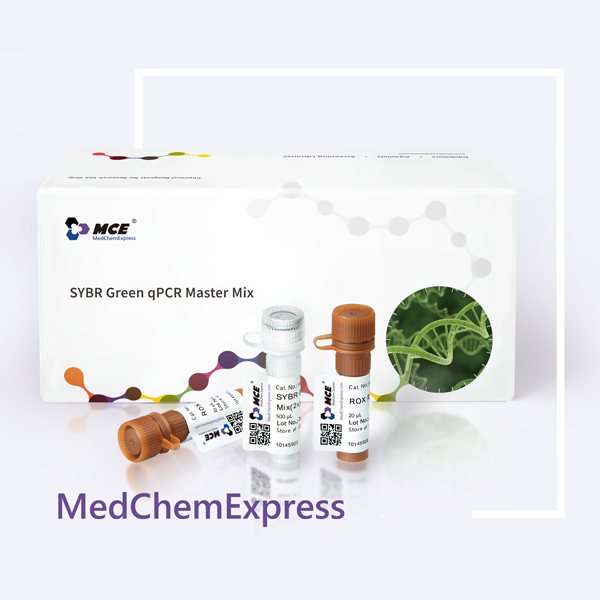 It contains a novel Taq DNA Polymerase, unique hot start reagents, optimized buffer, SYBR Green I, dNTPs, PCR Enhancer and PCR stabilizer. qPCR Master Mix is provided at 2× concentration and can be used at 1× concentration by adding template, primer, passive reference dye (optional) and ddH2O. MCE qPCR Master Mix can be directly used for robust and low-template quantitative PCR with high sensitivity, specificity and reliability. Two separate tubes of ROX Reference Dye are included for use with instruments that require a high or low level of reference dye for rectify the error of fluorescence signals between different wells. 2. Optimized buffer enhances specificity and reduces primer-dimer formation. 3. High sensitivity, specificity and reliability. 4. Passive reference dyes are provided for different qPCR instruments. • Inflammation . 2019 Mar 2. • Eur Rev Med Pharmacol Sci . 2019 Feb;23(4):1600-1609. • Eur Rev Med Pharmacol Sci . 2019 Jan;23(1):29-36. • Eur Rev Med Pharmacol Sci . 2018 Aug;22(16):5098-5105. • Mol Med Rep . 2018 Dec;18(6):5337-5344. • Mol Med Rep . 2018 Oct;18(4):3800-3808. • Mol Med Rep . 2018 Jun;17(6):8053-8060. • Exp Ther Med . 2018 Oct;16(4):3227-3232. • bioRxiv . 2018 Nov. Stored at -20°C protecting from light, and is stable for up to 18 months. Avoid repetitive freeze-thaw cycles while using. For immediate use, components may be stored at 2-8°C.